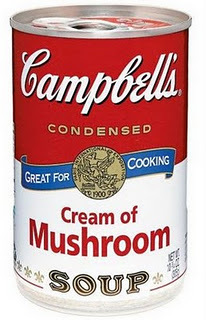 Last night I needed two cans of cream of mushroom soup for a recipe, and I saw that we only had one. I happened to have two small cans of mushroom bits and pieces from Aldi that I hadn’t used, so I made my own, instead! I just heated two Tablespoons of butter in a saucepan and then stirred in two Tablespoons of all-purpose flour. I then added in two cans of mushrooms (undrained) and stirred in a bit of milk (you can also use broth) until texture was creamy. This is perfect! Then you don’t get the MSG that’s in the canned kind! You can also make a lot and freeze it in can-size portions! That’s what I was going to say! 🙂 Thanks for sharing. I haven’t had mushroom soup in years b/c of the MSG. Yes, this is a great way to stay away from MSG! Perfect — just in time for Thanksgiving and all the wonderful tasty casseroles for winter. I do the same. You can control what goes in your meals that way. You don’t have ingredients that you can’t pronounce. I also make my own tomato, cream of celery and cream of chicken. I make big batches and freeze in 2 cups baggies for later use. Ditto Stacey! Recipes for those would be great! If you wouldn’t mind sharing those recipes Sheri I would LOVE them! 🙂 Thanks! I would so love the recipe for the cream of chicken soup. Please. AND question – how to you freeze it and how long will it last in the freezer. Thank you for sharing. Use cornstarch instead of flour for those who need gluten-free! Thank you for this! We’ve recently had to go gluten free and I was reading this thinking, hmmm…wonder if this could be gluten free. I always have made my own with Whole Wheat Flour. I use the same standard recipe and make cream of celery, mushroom, chicken, or asparagus and freeze it in quart size zipper bags to have on hand. AND I can make it completely organic. I have used powdered milk also if I am short on milk and it works just fine! How would you go about storing this? Could it freeze? That would be great to do when you get mushrooms on clearance! 🙂 Thanks for sharing! Just to clarify, the 2 tbsps of butter + 2 tbsps of flour makes the equivalent of 1 can? Thanks! If you look in the post it says that she also used 2 small cans of mushrooms UNDRAINED and then added milk. So I would think it would make at least 1 can by the end? Yes, this is what I used to make one can – APPROXIMATELY. It probably made a bit more. But the two tablespoons of butter and two tablespoons of flour make the perfect roux to add in the two (small) cans of mushrooms and milk. You can really add and take away as much as you need for the recipe. Yes! Awesome tip! I buy mushrooms when they are marked down, chop them and then dry them in the oven and then store them in my pantry. That way, I always have a stash when I need to make cream of mushroom soup. May I ask what type of mushrooms do you purchase for this? I am not mushroom savy so I know nothing about fresh mushrooms. But do use cream of mushroom soup. Just want to make my own . Thanks for sharing. I use the button mushrooms–nothing like portabella or some other fancy name–they are usually the ones that are in most abundance on the shelf. Thank you so much for this tip. Never knew that you cd dry your own. I would LOVE to see more things like this! Also, I second Kelly’s question. Great post! I was just thinking about this. Basically, you’re making a white sauce – a staple of French cooking. When I first went to France a number of years ago, I looked at the grocery shelves and my recipe cards of casseroles from home and wondered how to cook without Campbell’s! Long story short: a few years ago, I decided if a whole nation (and probably most of the world) can cook without canned condensed soup, then so could I. I haven’t bought since, and haven’t missed it. Occasionally, I make a white sauce, add in herbs, mushrooms, or whatever, and make a chicken pot pie, or casserole. So delicious! Much cheaper, tastier, and free of junk. However, it does take a little more time, so now I am less inclined to make that kind of saucy, cheesy casserole – and that is a good thing, since that kind of cooking on a frequent basis is not good for the waistline. For people looking for a recipe, just look up “white sauce” in a cookbook or online. That’s all you need for the base recipe. Add whatever you want for flavor, like mushrooms or herbs. Yeah!! It’s like the post I’ve been waiting for… I’ve searched for recipes before, but some were too complicated, and I just wasn’t sure if they’d really work. I have lots of recipes that I hope to improve with homemade cream of mushroom soup! I ALWAYS make it from scratch! No yucky and unpronounceable ingredients, plus you control what goes into your meal. Definitely worth the extra effort and it tastes so much better. Great tip! Cans are easy but this is even better with hardly any effort required either. Thanks. I have a recipe to make up a fat free cream base soup base… Its dry and all you have to add is the liquid to reconstitute. Would you like me to post? I would! I prefer using fat free varieties! Yes, please. I was just wondering how to do this without the butter. This is perfect for those households that have corn and soy allergies. Also the philly cooking creme thinned with a little milk works just as well! Lots of extra flavor! I can’t stand those canned creamed soups, blech! Great! I can’t have dairy and hadn’t found a recipe for cream of mushroom soup that I could make. Now I can! Yea! I’ve always thought about making my own, but have never tried it. I bet it’s a lot healthier too! Thanks so much for sharing! 1) freezer zip-top bags — lay flat to freeze and then arrange however you like in your freezer. 2) cottage cheese/sour cream plastic tubs. They stack well and are easy to wash and reuse, but they obviously are more bulky than freezer bags. I use those tubs for soups, sauces, milk, etc. I just don’t recommend thawing in the microwave. I have been making my own cream of mushroom soup for a long time mostly the same way you do except: I buy mushrooms when on sale and dehydrate them. When I am ready to make the soup I take some and rehydrate with some warm water then use like fresh..everyone loves it. Great idea! It’s crazy how much people pay for soups when it’s just water, salt, maybe a little flour and fat. Most of the money is going for the packaging and advertising. I wish more people knew how simple, economical, and healthy it is to make your own condensed soups! You say it’s equivalent to one can of soup? Any creamed soup I’ve ever bought are condensed and need to be combined with a can of water or milk making them equivalent to two cans. Do I need to double the recipe to get the two can amount I get from condensed?